Today Global Specialties introduces five new models to its line of electronic Educational Kits. 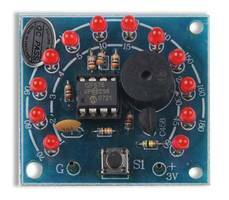 These kits are a fun and inexpensive way to learn electronic circuits and controllers. They may be assembled by soldering to the included PCB or without soldering on any Global Specialties Trainer or Solderless Breadboard (not included). Detailed assembly instructions included with each kit. Some kits come pre-assembled. Practice your soldering skills then let your creativity run wild with unique, real world applications. All models come with a 90-day warranty and are RoHS compliant.